Echinacea purpurea (picture right) is the most widely used of the species and are widely referred to as ‘Purple Cone Flowers’ although all of purple, white and yellow species are available (yellow is very difficult to find). Blooming in late summer, they get their name from the cone shaped flower heads which are large and bright adding great color to the perennial border and are also attractive to butterfly’s. When planting E.purpurea or other species, look for a humus rich well drained soil in a sunny position. Care is fairly simple, keep moist in warmer months for best performance and cut back in winter as plants die back. ‘Purple Cone Flowers’ can be used in the garden border and make an excellent cottage garden plant, they can be grown in containers, we suggest you use a large pot as they can grow reasonably tall, they are good as cut flowers. 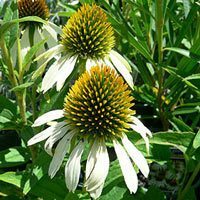 All Echinacea are not purple, E. purpurea alba (picture right) is the white cone flower, also known as Echinacea purpurea ‘White Swan’, similar growing conditions as others. ‘Magnus’ is a purple cultivar that reaches over 1m and flowers in mid summer through to spring. A white species E. purpurea ‘alba’ is also available sometimes named ‘white swan’. A few named cultivars are around including E. purpurea ‘prairie splendour’, E. purpurea ‘magnus’ , and ‘ruby giant’. They are also popular as a herbal remedy and used for a range of conditions, including as a cure for colds. 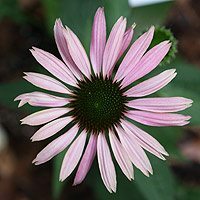 The common belief is that taken regularly at the first sign of a cold echinacea will provide some relief. It is believed that echinacea can be a stimulant for the immune system, however most clinical studies have found no firm evidence of this. It is reported that echinacea may have side effects including, nausea and dizziness, so consult your doctor before using.